"Hey Jony!" Steve Jobs hollered with child-like excitement the first time he introduced Facetime to the world via iPhone. Jobs revealed with gleaming eyes, "I'd grown up here in the US watching the Jetsons and Star Treck and just dreaming of this!" —that he'd always wanted to Facetime with someone one day — a monumental moment that was fittingly shared with Jonathan Ive. He was not only Steve's right hand in design at Apple, but as Jobs's wife, Laureen Jobs described him, "Jony is one of Steve's spiritual soul mates." He was even at the hospital during Jobs's final hours. Jonathan Ive is the Senior Vice President of Industrial Design at Apple. The 44 year old multi-award winner English designer — including MIT's top 100 innovators under the age 35 back in 1999, and the Design Museum's inaugural Designer of the Year award in 2002, 2003, and 2004 — was the principal designer behind iMac, (titanium and aluminum), the PowerBook G4, G4 Cube, MacBook, unibody MacBook Pro, MacBook Air, iPod, iPhone, and iPad. 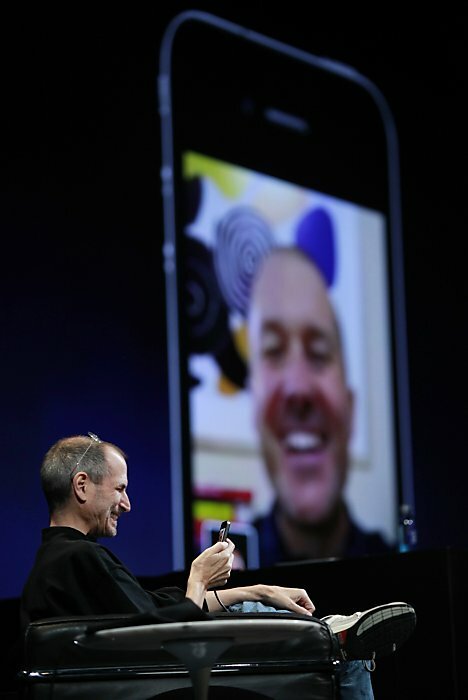 Have a watch at Ive's memorial speech in honor of Steve Jobs during the October 19 Steve Jobs Memorial at Apple's headquarters in Cupertino, as well as the Facetime moment between Steve Jobs and Jony Ives (below).